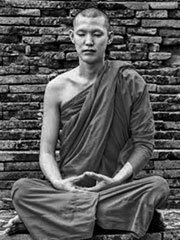 In Pāli, a bhikkhu (male) or bhikkhuni (female) is a fully ordained Buddhist monk. The respective Sanskrit versions are bhikṣu and bhikṣunī. The word literally translates as «beggar» or more broadly as «one who lives by alms». It is philologically analysed in the Pali commentary of the Buddhaghosa as «the person who sees danger (in samsara or cycle of rebirth)» (Pali = bhayam. ikkhatīti bhikkhu) He therefore seeks ordination in order to release from it. A bhikkhu has taken a vow to enter the Sangha (Buddhist monastic community) and is expected to obey rules of conduct (typically around 253 for a male) as set out in the Vinaya, although there are considerable local variations in the interpretations of these rules. A novice monk or nun in the Tibetan tradition takes 36 vows of conduct. The minimum age to take bhikkhu vows is 21 years.